【石燈】MA-C-00016 - 石燈、牌樓 - 萬寶路石雕坊 - Powered by Discuz! Stone Marlboro Square was founded in 1985, to sandblasting engraving and computer started; over of domestic and foreign well-known attractions, temples, churches and mansions built the case ... and so on. 本公司有各種庭園造景石雕，完全依照客戶需求指定客製化雕刻製作；照片謹供意象參考之用，歡迎與本公司聯繫 (06) 2491871 王先生。或歡迎蒞臨本公司網站 http://www.marblecarveworks.com/ 參觀指教!! 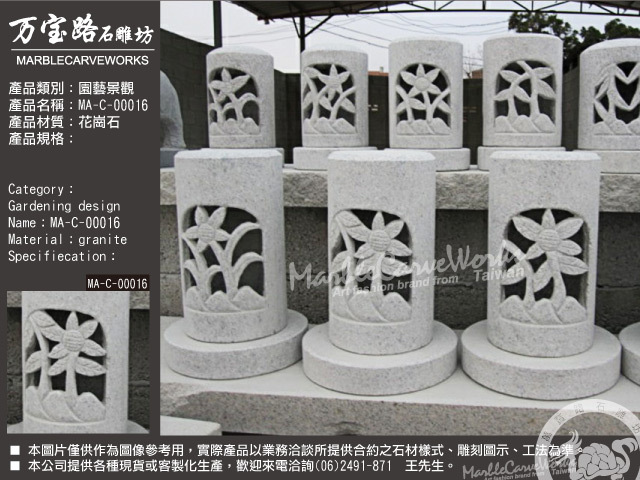 The company has a variety of stone courtyard, in full accordance with customer specified custom carved; photos like for the image reference, please contact the company 0086-6-2491871 Mr. Wang. Or Welcome to visit our websitehttp://www.marblecarveworks.com/ teach!! All our products fully meet customer needs, so adoption of "customized" services. Style and the client to confirm an order, the company will provide production according to customer needs artwork, and more marked production size, material, style ... and other information to customers to confirm; the customer to confirm and complete the contract signed with the deposit, The Company is in accordance with the terms of contracts for production and delivery, in order to ensure that the rights of both parties. GMT+8, 2019-4-19 04:23 , Processed in 0.095430 second(s), 31 queries .